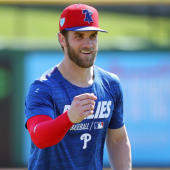 Phillips said Monday that he intends to play in the majors this season, Jon Morosi of MLB Network reports. Phillips spent most of the 2018 campaign at Triple-A Pawtucket in the Red Sox organization before receiving a September callup. He made little impact in the season's final month for Boston, appearing in nine games and hitting .130/.259/.261 with one homer and a 4:7 BB:K.